Brendan Trimboli looks over Weston Drive in November 2018 in front of his home. The city is considering asking a new tax-increase question in April to raise money for street maintenance. 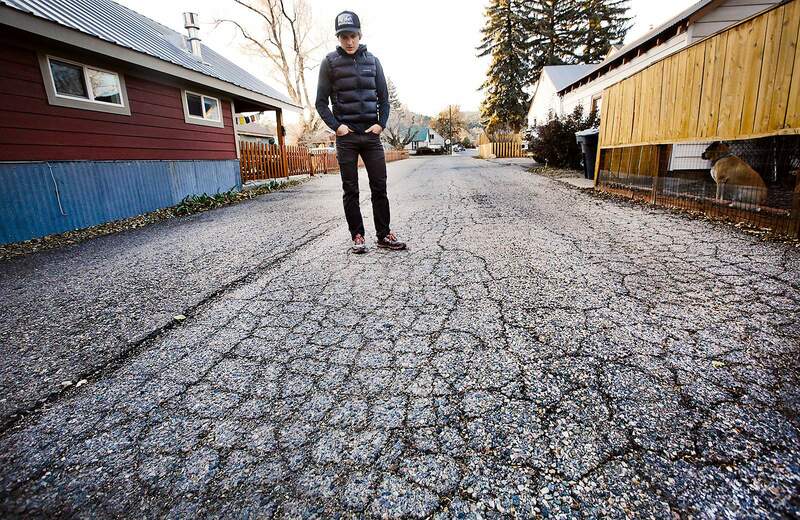 Durango residents should expect a question on the April ballot to raise sales taxes to pay for streets, although not every city councilor agreed this would be the best option. Durango city councilors on Tuesday were presented with seven options to overcome a deficit in the general fund that will force leaders to begin cutting services if nothing is done. Options presented ranged from doing nothing, which staff does not recommend, to approving a new tax or reapportioning an existing one. Any proposal to reallocate existing funds from dedicated revenues or to establish another tax would require a vote. “What I’m hearing is there will be a sales tax question on the April ballot,” said Mayor Sweetie Marbury after a two-hour conversation between staff members and councilors during a special study session. The City Council faces difficult budget choices in the wake of a failed ballot measure designed to raise up to $7.5 million annually for 25 years to pay for city streets, sidewalks, law enforcement and municipal buildings. That measure, which would have raised the sales tax by 0.55 percent and property tax by 5.4 mills, failed by more than 20 percent in the November General Election. All but two options would need voters’ approval. Doing nothing doesn’t require a vote – that’s pretty simple. Mayor Pro Tem Melissa Youssef and Councilor Chris Bettin both flirted with this idea. But staff members proposed another option, one brought to the city by council candidate and Planning Commission member Kim Baxter. Baxter’s plan involves using funds in a dedicated sales tax, which was approved in 2015 by about 70 percent, to pay for park maintenance, something that’s being funded by the general fund now. The amount that would be freed in the general fund is a little over $2 million. That’s about as much as the city needs to maintain its roads. Many city councilors rejected this idea, saying that it would be a short-term fix to a long-term problem. Other options would require a vote. Three of the choices would establish a new, dedicated sales tax and two would reapportion money from the Parks and Recreation Department to pay for infrastructure projects. Any vote would be placed on the April ballot. One option would establish a 0.5 percent sales tax increase for 10 years, a revenue stream that would generate about $2.1 million in the first year and raise a total of $44.5 million by 2029. The money would be used for street operations, maintenance and capital improvements, a simplification of November ballot language that voters said they found complicated. But the option wouldn’t address the city’s need for a new police station. Also, asking for more money could be seen as a rebuke of residents who say the city is already properly funded. Other tax plans include imposing a 0.5 percent sales tax until 2026, which would raise $34.45 million by the time the city stops collecting the tax. That revenue would be used for street operations, maintenance and capital improvements. If passed, it would compete for reauthorization with a 2005 Parks and Recreation dedicated sales tax that also expires in 2026. Councilors spent most the special study session waffling between the two 0.5 percent sales tax increases. At the end of the meeting, most agreed that a 0.5 percent sales tax for 10 years would be most appropriate. “Ten years gives us the time to re-establish our fund balance,” Councilor Dean Brookie said. City councilors could also ask for a 0.25 percent tax increase, but the $17.41 million raised by the quarter-cent tax increase would be insufficient to replenish the general fund contingency and fund balance, something the city says it needs. Youseff said a 0.25 percent tax would buy the council some time to come up with more long-term solutions. Two other options would reapportion existing tax revenues dedicated to the Parks and Recreation Department. Reallocating a 0.5 percent sales tax approved in 2005 would raise about $2.1 million annually for street operations, maintenance and operations, and reallocating another 0.05 sales tax approved in 2015 would raise about the same amount. But many city councilors rejected the notion of reappropriating money for parks and recreation to pay for streets – doing so would not address the problems with the general fund contingency and fund balance and could also further erode trust between residents and the council. “If we reallocate, we could be seen as forsaking voters’ opinion,” councilor Bettin said. bhauff@durangoherald.comAn earlier version of this story gave an incorrect percentage of proposed sales tax increases.